Our newly refurbished ground floor apartment offers a comfortable retreat fifteen minutes walk from Brighton mainline station and two minutes walk from the popular eateries and bars of the vibrant up and coming London Road. We chose this flat because of its location in the real Brighton, we’ve lived here for twenty years and never get bored of its relaxed, independent and creative vibe. The Duke of York independent cinema is at the end of the street, walk ten minutes down to Trafalgar Street and the North Laine where you’ll find cafes, bars, real ale breweries and boutiques for relaxed shopping and people watching. The seafront is twenty minutes walk straight down past St Peter’s Church (where there’s a taxi rank for longer trips ) or hop on a bus at the end of the street to get there. The accommodation is arranged as open plan living space-kitchen and two double bedrooms, one with a king size bed and the other is arranged as twin beds . There’s a good quality sofa bed in the living room for an extra two guests. The kitchen is equipped with all the utensils, cookware and tableware that you need to prepare meals and the dining table can extend to seat four-six. There’s a tv, freeview and Wi-fi. Linen, towels, soap, shampoo and toilet paper are provided as are tea and coffee. We supply information about excellent restaurants, bars, brewery pubs, theatres and music venues so you won’t miss anything. Long stay: There’s a long stay car park on Providence Place, Brighton BN1 4GE five minutes walk away. It costs £14 per 24 hours. please see map of how to drive to it in the photo section of this listing. Outside the flat: You have to pay to park on the street between 9am-8pm. Do not park in a resident’s bay between these hours but use a parking meter bay which is £1 per hour up to 4 hours, there are plenty of these OPPOSITE the flat. After 8pm you can park anywhere until 9am. So I suggest guests come to the flat and park in a parking meter parking space opposite the flat and unload their things, then the next morning drive to the long stay car park which is five minutes away. There is a screenshot in the photo section of this listing. We will treat you with care and respect and trust that you will treat our apartment and lovely neighbours with the same respect. Check in is from four pm and check out is by eleven am. We ask guests to please bag up tiger rubbish and put it in the no 66 bin outside. Geoff and I live nearby and have done so for twenty years. We absolutely love it. There's so much on our doorstep to do but its also really relaxed. We love walking round the town and beach, or driving round Sussex and enjoying walking on the South Downs with our dachshund Willy. Central Brighton is unique, I immediately unwind when I get off the train from my London commute where I teach in an art school. Geoff is always around to answer your calls as he works locally. We've always lived in this part of town. 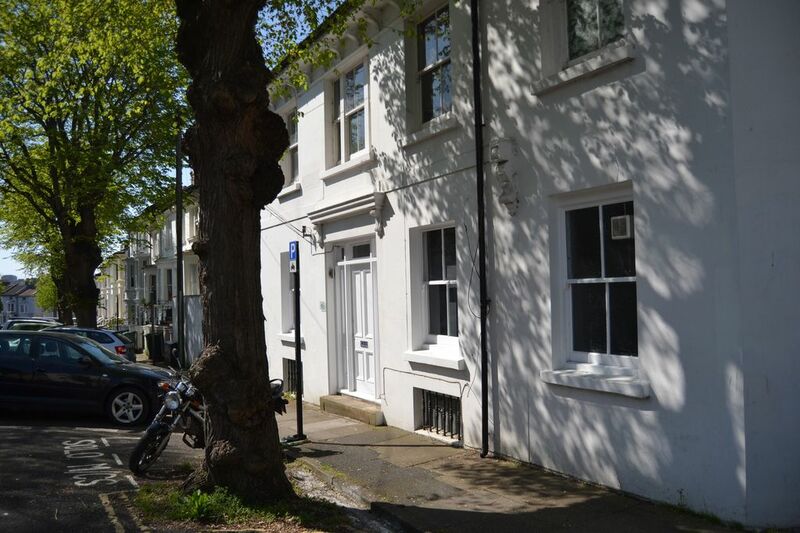 It's near the station, the North Laine and a twenty minute stroll to the seafront. The quality of local restaurants and take-away food is fantastic and the London Road has some of the best; from street food such as Yefsis, Sunbirds and Fatto a Mano, to more sophisticated places like Senor Buddha on Preston Circus, Semolina on Baker st and Oshio on Trafalgar st. There are several of the top ten in Brighton very nearby: Silo, Pascere, Isaacs, Chilli Pickle etc It's a buzzy, thriving area full of history and romance. It's super central for venues, theatre, clubs and breweries. Its in a laid back area, full of eccentrics and thriving independent businesses. It's never boring and we never stop enjoying ourselves living here. We enjoy sharing it with visitors, we are proud of our beautiful city. Very nice and fully equipped with great facilities. Comfy beds and sofa. We came down to stay for a long Weekend during Brighton marathon and would do the same again. Location was excellent. Communication and service was perfect. Thankyou so much. The flat was clean and beautifully presented.The location was good easy to find parking and with help from friendly helpful owners we also found overnight parking within easy walking distance. Great Indian restaurant close by the Shahi Tandoori and the pub the Signalman near by also nice . Not too far to walk to the shops etc. Overall very impressed. Lovely apartment very clean and well equipped. Within walking distance to town safe 24 hour parking ten minute walk away. Christabel very helpful. Lovely apartment in a convenient location. We really enjoyed our stay. We thoroughly enjoyed our weekend in this tastefully decorated and tidy flat, close to the centre, the sea and parks. The owner is a lovely host, picked us up and was very helpful throughout our stay. Thank you!